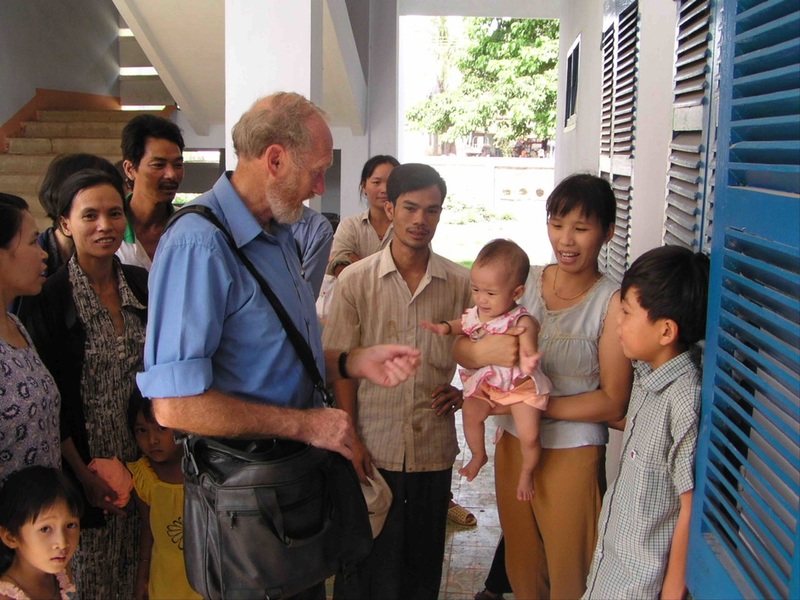 In 2001 New Zealand paediatrician Dr Alan Parsons visited Binh Dinh for the Health Trust. He identified a significant need - and local wish - to improve neonatal and paediatric care in the province. NZ Volunteer Service Abroad (VSA) and NZAID were already doing good work in the area; midwife Trish Thomson was achieving excellent results with a neonatal resuscitation programme. Our aim was to work with communities to build on these successes. New Zealand's historical relationships were the platform for educational initiatives that continue today. NZVHT realised that as well as enhancing medical knowledge, a programme to boost nursing and midwifery standards would also be critical. Soon after it started, volunteer neonatal nurse Jane Bocock from New Plymouth and Dr Johan Morreau, a paediatrician from Rotorua, joined the late Dr Parsons on the maternity project. The team worked closely with Director General Dr Hung from the Binh Dinh Department of Health in recognising the benefits of centralising tertiary neonatal care. With his support, a programme was introduced at Province Hospital, Quy Nhon, a facility managing around 14,000 deliveries annually – around the same number as the Auckland region. District hospitals appointed senior paediatric nurses; Anne de Bres joined NSA as nurse educator in 2009. Infection control activities, a change from a task-focused to a baby centred neonatal nursing, and the introduction of family-inclusive care dramatically improved outcomes - and community confidence in these hospital services. More than a decade after the project started, volunteers continue this vital work. The team now includes New Plymouth paediatrician Dr John Doran and Hamilton neonatal nurse specialist Jim Fowler. Each year we work with the Binh Dinh Department of Health, senior doctors and nursing managers to identify workforce and equipment needs, and run workshops for practitioners across the province. These focus on clinical needs, and the newborns's journey through birth and into the home. Monitoring reveals our efforts have assisted a significant reduction in newborn mortality at Province Hospital. Ongoing intervention and training is required for these gains to be sustained. High child mortality rates persist in the highland districts of An Lao and Van Canh. To address these, we are broadening our programme and are training staff working in these districts to treat prevalent conditions: birth asphyxia , pneumonia , sepsis and gastroenteritis. The plea for our ongoing help in saving lives comes from all levels of the the health system – directors, senior medical and nursing staff, doctors, midwives, and nurses at the coalface.